The humble wood-chopper is one of the oldest tools known to man. Its earliest forms can be traced back 1.6 million years to the Neolithic Area, where our Homo ergaster ancestors would use stone-built hand-axes for various practical tasks such as digging, splitting wood and chopping up grub. Naturally, it didn’t take long until they became popular weapons of choice for inter-clan scraps; but it wasn’t until the 5th century that the Germanic tribes – most notably the Franks – decided that lobbing them at each other could spice things up a bit on the battlefield. Carrying throwing-axes quickly became “a thing” for The Franks – uncomplicated, versatile and ideal for nailing a Goth or Roman fighter from distance. The Vikings also loved an axe. Like, proper went potty for them. 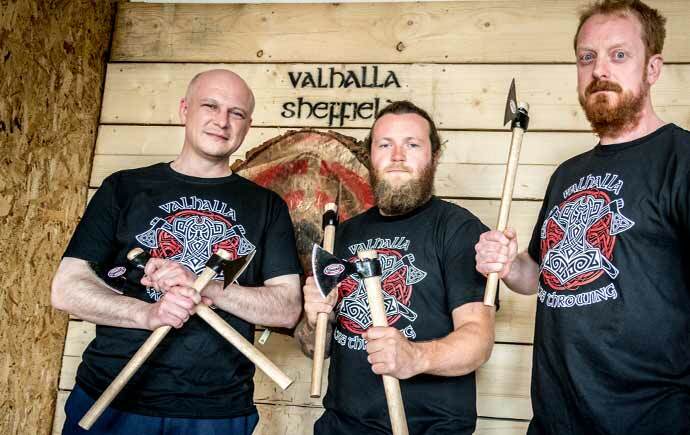 They’d have a wide variety of types used for both combat and domestic purposes, and today, if you’re feeling a bit of stress or just fancy toning up the lats a bit, you can make like Odin and unleash your inner Norseman at Valhalla Sheffield – the city’s first indoor axe-throwing venue. After a particularly demanding working day, Team Axeposed (that’s your boy, Will and Leo) decided to challenge Team Valhalla (that’s Andy, Simon and Kev) to a few rounds so we could escape the drudgery of the office and let off some serious steam. He finished speaking, turned around and while showing us the correct technique – keep it straight, bring over the shoulder, release when arm is parallel to the ground and aim for one rotation – propelled an axe into the wooden target board with a satisfying thud. He made it look pretty natural, with his Norse-like beard and tribal tattoos adding extra authenticity, but it took Team Axeposed a fair few attempts to start hitting the target consistently and stop sending hatchets cascading into the roof or protective cage of the throwing alley. I’ll tell you what, though: when you did achieve that perfect rotation and resulting connection with the board, it didn’t half feel good. For a couple of minutes I’d feel like I could give Eric Bloodaxe himself a fair scrap, until a poor follow-up throw would strip away any fleeting bravado and had your stung warrior here returning to the team corner with muttered apologies. The first round, which involved clocking up the highest points on the boards with a throw each, saw Team Valhalla scrape a narrow 9-10 victory – though Leo, son of Olaf, notably managed the first bull of the day. Next up, a game of ‘Protect the Royals’ saw us aiming to split various cards in exchange for points which, after what had to be a record-breaking round length due to some truly woeful efforts, saw Team Axeposed level the scores after a fine lob from Will. 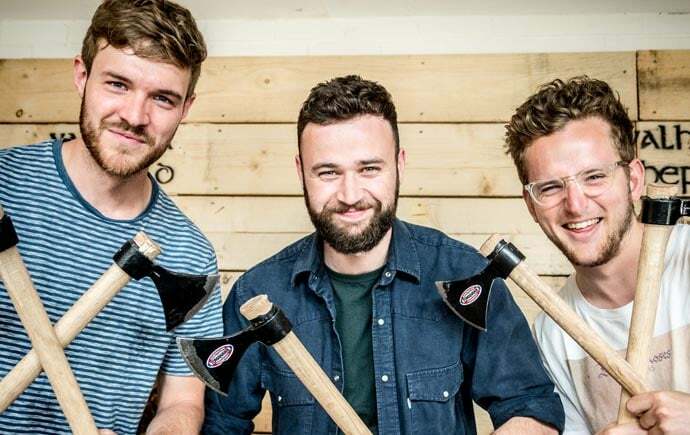 Finally, the tie-breaker would be a simple game of axe darts. Starting with a specific number, each team member would work their way down to zero without going bust (we frequently did just that). After plenty of huffing, puffing and under breath Nordic curses (“May you choke on Odin’s missing eye!”), Kev completed in impressive style to finally put us to the sword, erm, axe.